This entry was posted in weapon and tagged 9x19, German, gubmachine, history, infantry, MP40, WW2. Bookmark the permalink. Judging by the brass flying through the air, it looks like it’s in 7.62×25 Tokarev, though the necks look a little long. I agree, brass is as long as the magazine is deep. WWII reenactor comment points towards blanks as well. If it’s a different caliber, it’s probably .30 Luger rather than 7.62×25. Just a guess however. Looking at the casings in the air, they appear to be bottlenecked, so not 9mm. The casing in the air above his head and the one near the (regimental?) band on his sleeve show the opened crimp of blank cartridges. So is that a small blank firing attachment at the muzzle? Is it a really well done blank-firing replica? This is an SS Room Mp40 BFONG, or Blank firing gun. It fires modified .556 brass that when crimped, closely resembles a 9mm casing with the bullet on the end, so it is all one length, which explains the lengthened case. They rounds are called 5.56 kurtz, or 9.3mm, depending on who makes it. The gun is designed with the bolt where the chamber should be and the chamber where the bolt should be, the magazine is loaded backwards so it would appear that you would be shooting yourself when fired. It fires about 800rpm in the open bolt position, and it is declared as a non-gun because no real working gun parts can be installed without some major modification to it. 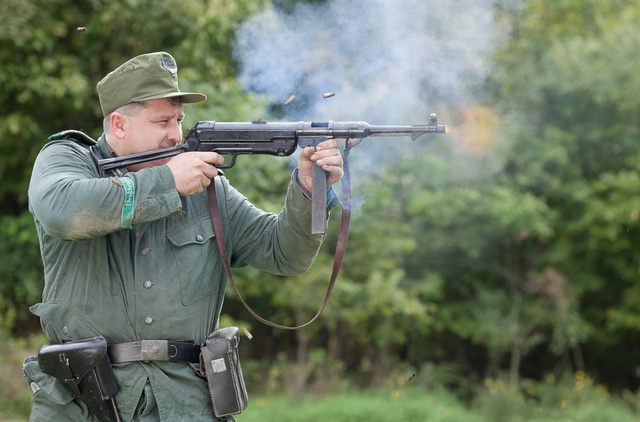 SS Room is no longer in business, but another company has taken up building these at about $3600.00 each So for a reenactor you get full auto action without the ATF red tape. Expensive, but fun. Передай стрелку, что у него Люгер не с той стороны висит. Надо слева на брюхе. Blanks being ejected look like 7.62×25 bottle-neck ctgs. If what Terry above says is true, why is there muzzle flash? There’s an aweful lot of smoke, too. Almost looks like black powder or a substitute.